The highest recognition and honor a building can achieve in the United States is the designation, National Historic Landmark. The Guaranty Building, built in 1894-1895, was so designated in 1975. It is nationally regarded as a milestone in modern skyscraper architecture, and Chicago architect Louis Henri Sullivan was its creator. With its refined and elaborately decorated terra -cotta exterior, the building is not only supremely handsome, but its inner structure of steel support with applied exterior curtain walls was a major innovation from wall supported structures that were the only way to build since before the Greeks. The breakthrough started by architects like Louis Sullivan led to the great American invention, the skyscraper. Louis Sullivan (1856-1924) studied architecture at Massachusetts Institute of Technology and the Ecole des Beaux Arts in Paris. In 1879, he Joined the architecture firm of brilliant Dankmar Adler in Chicago. Sullivan became the leader of the famous Chicago School of architects. He developed an organic theory, which he described in three words, "Form follows function," which may sound obvious today, but was highly original in the latter part of the 19th century. As American cities and industry grew, so did office buildings, which wanted to be in the thick of things, and that meant an urban setting. Owners of such buildings, therefore, wanted to get the most out of crowded, valuable downtown sites. This, in turn, created a demand for taller buildings. Historically, there were two limitations that restricted the height of buildings. One involved vertical transportation, which was solved in the 1860s by the invention of the modern elevator. The second concerned the structural system. which limited building heights by the number of stones or bricks that could be stacked on top of one another without having impracticably thick walls. By 1890, steel was being mass produced, and it permitted a strong. slender skeleton that could support itself, the weight of many floors, and a thin, light curtain wall for weatherproofing. The remaining challenge was to make the end result aesthetically pleasing. 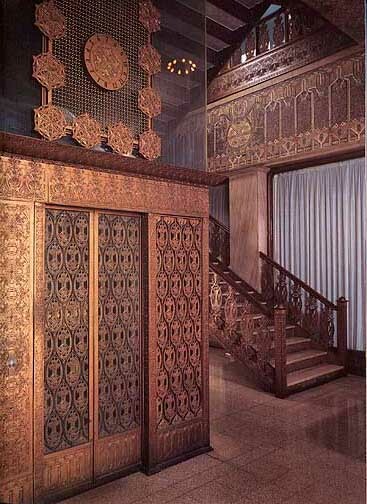 Louis Sullivan was the first with the best solution. His skyscrapers looked tall, proud, and soaring. Consider the Guaranty Building, one of the earliest skyscrapers and certainly one of the most handsome. Vertical shafts of piers soar uninterrupted past multiple, uniform office floors to be capped by a row of oculus windows and a mighty cornice. The whole has the elegance of a rectangular fluted column. Then, to give the building its final exuberance. Sullivan sheathed it in lively, reddish brown terra cotta that is ornamented with elaborate designs. The Guaranty Building clearly shows Louis Sullivan to be the most competent architect of his period and is a treasured masterpiece on Buffalo's urban landscape. Photo above: Fine metalwork on the interior of the Guaranty Building reflects the elaborate designs of the exterior facade. A fire in 1974 severely damaged upper floors, and the building was almost razed. It was superbly restored, fortunately, at a cost of more than $8 million, making the building a jewel in Buffalo's Downtown. It is National Historic Landmark.